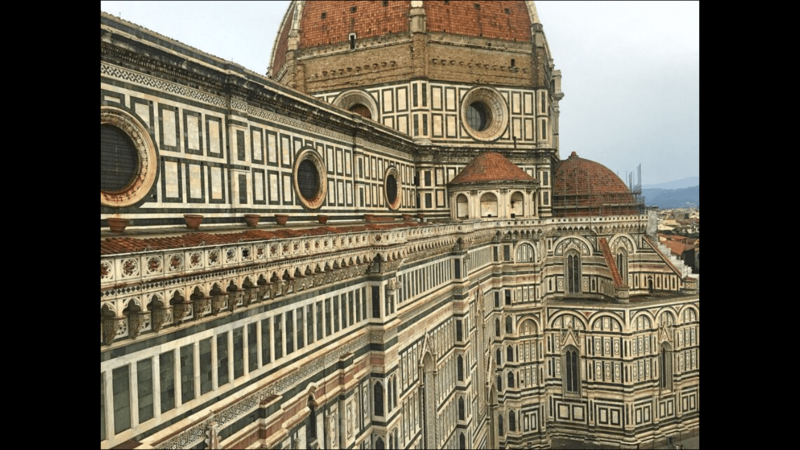 We came through Florence last October and loved it: beautiful architecture, fantastic museums, even great running along the Arno. 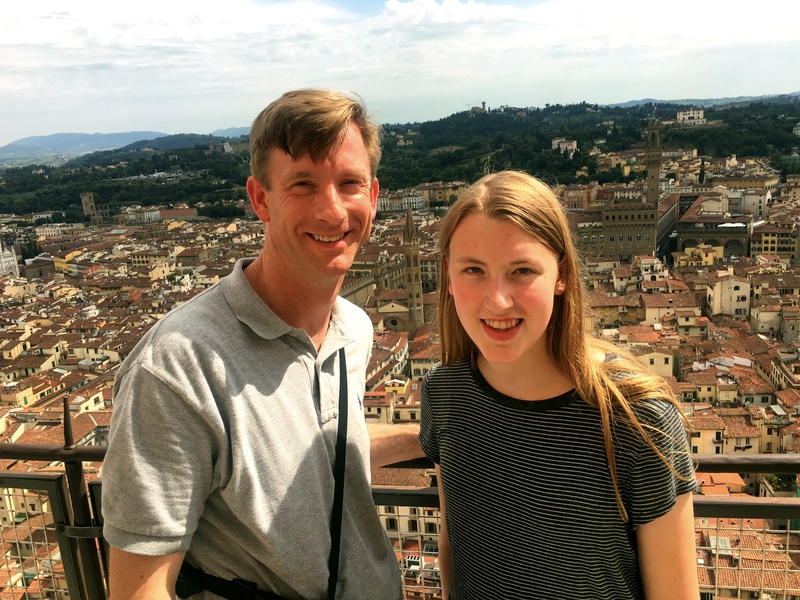 So when our friends Dan & Laura wanted to travel in Italy this year, there was no question that we’d come back. I mean, it’s Florence. There’s not much new to say about the city; it didn’t change a lot in the last eight months. A big change for us, though, is that we were a lot more active with the Germains than we were on our own. We can be kind of lazy as we’re traveling around and don’t always get to all the tourist sites one should. And not that rarely we fail to make reservations in advance for key places like Da Vinci’s Last Supper in Milan. When traveling with friends, though, who need to cram more stuff in on a time-limited vacation, we step it up a notch. And so it was in Florence. 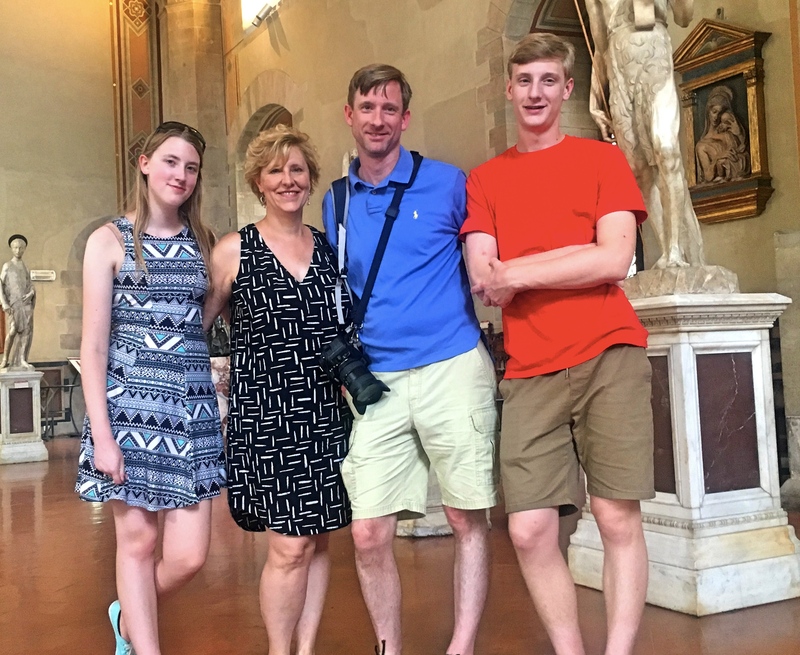 Some of it we saw last year – the Duomo, the Baptistry, the Uffizi – but the big highlight for us was the the Grand Museum of the Duomo, something Dan bought tickets for before he left the States. Wow – what a tragedy that we’d missed it last year. 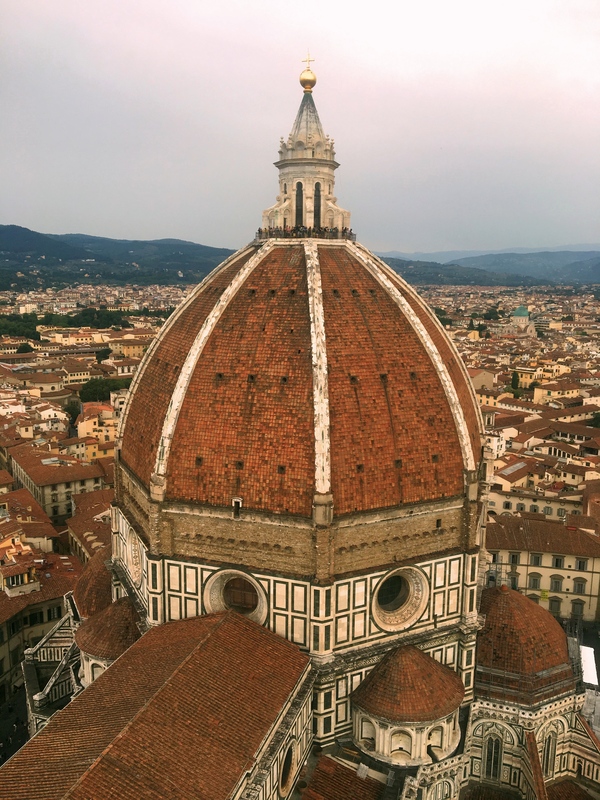 Chock full of great art, along with a full-scale replica of the medieval facade of the Duomo before it was renovated in the 16th century renaissance style. Very cool. And then there was that David guy. Again, one of those things for which you need to get tickets in advance. So we had tickets in advance. Mark & I have seen him before; we were here in 1995 and we’d both been there years before we met. 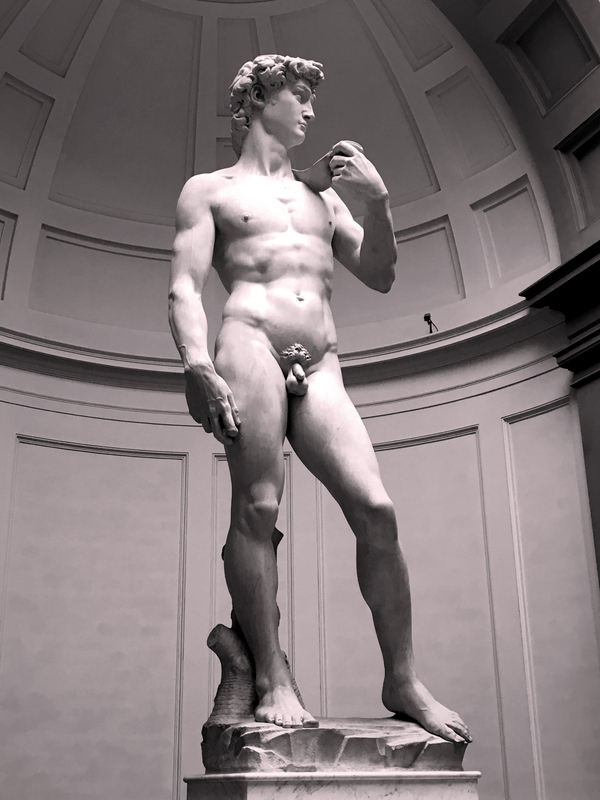 Still, it’s a danged impressive piece that I probably enjoyed even a little more this time having just read Irving Stone’s biographical novel of Michelangelo, The Agony and the Ecstasy. 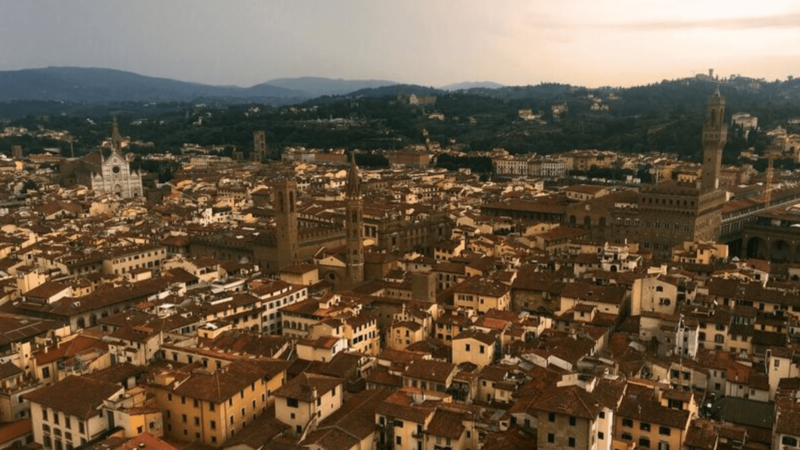 There was one noticeable difference in Florence: while there are a lot of tourists in Florence in October, there are A LOT of tourists in July. Oh my God. The historic core of the city is a pretty small area and there were just thousands and thousands of tourists everywhere. Next time we come here, we’ll do it off season. 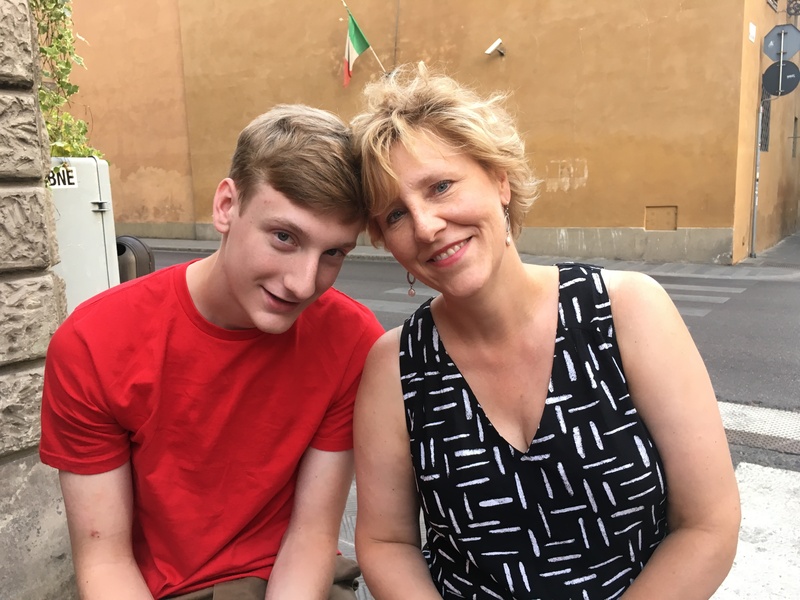 We’re traveling with the Germains for two weeks; from Florence we go to Bologna, Venice, and Rome. So without a lot new to say about the city, here are a bunch of pictures. 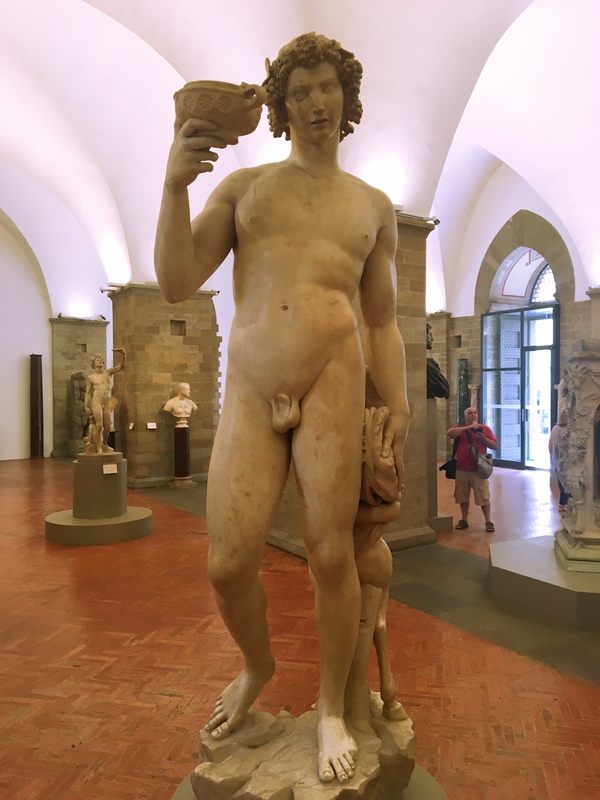 The Bargello, the oldest public building in Florence and at one time a prison, houses a wonderful collection of statues and is probably my favorite spot in Florence. This Bacchus was done by a young Michelangelo and was in fact rejected by the Cardinal who commissioned it. After all, Greek gods are supposed to be GODS, not dissipated, louche drunks. 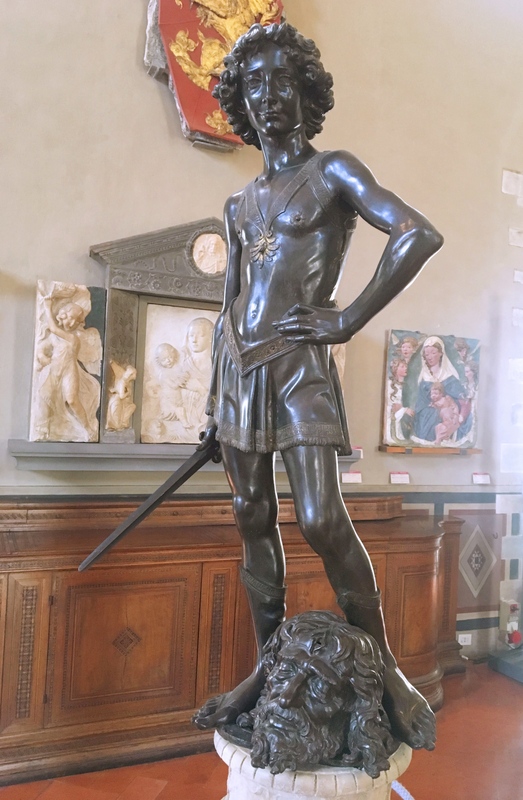 Here’s Verrocchio’s David, also in the Bargello. Not quite as masculine as Michelangelo’s. 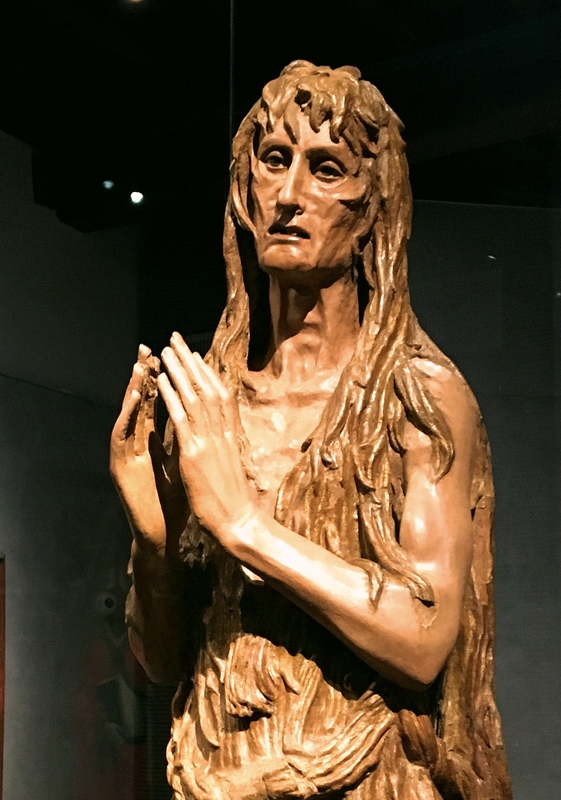 Meanwhile, over in the Grand Museum of the Duomo was this grand Mary Magdalene – living as a saintly hermit after the crucifixion – by Donatello. It looked so modern it was hard to believe it was well over 500 years old. 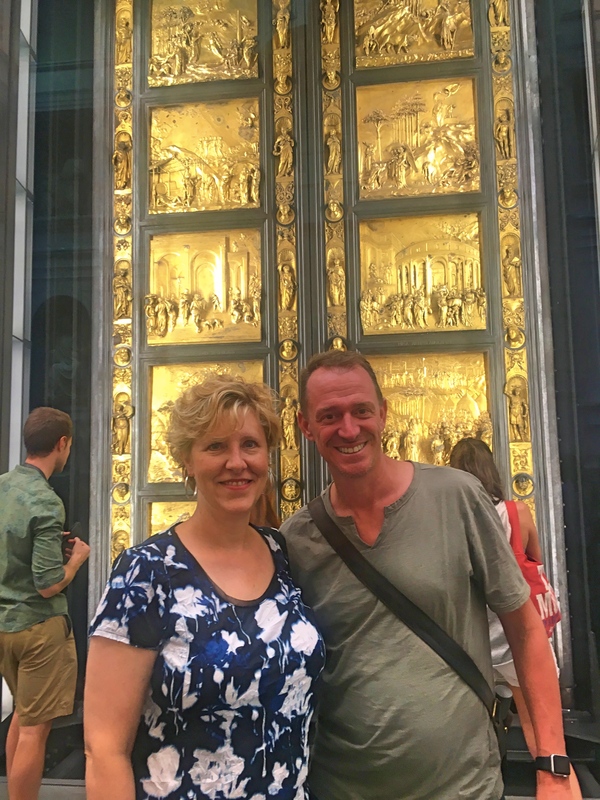 Laura & Mark in front of the original doors to the Baptistry of St. John, now kept in the Grand Museum. Created by Lorenzo Ghiberti in the early 15th century, Michelangelo called them the Gates of Paradise. 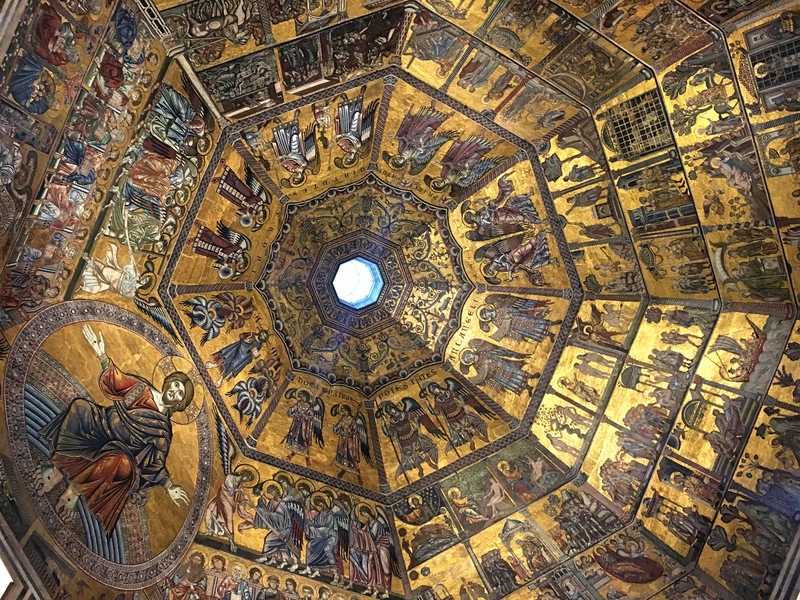 The Baptistry, dating from the early 12th century, is the oldest part of the cathedral complex. This is the ceiling, clearly Byzantine, with no signs yet of the Renaissance to come. 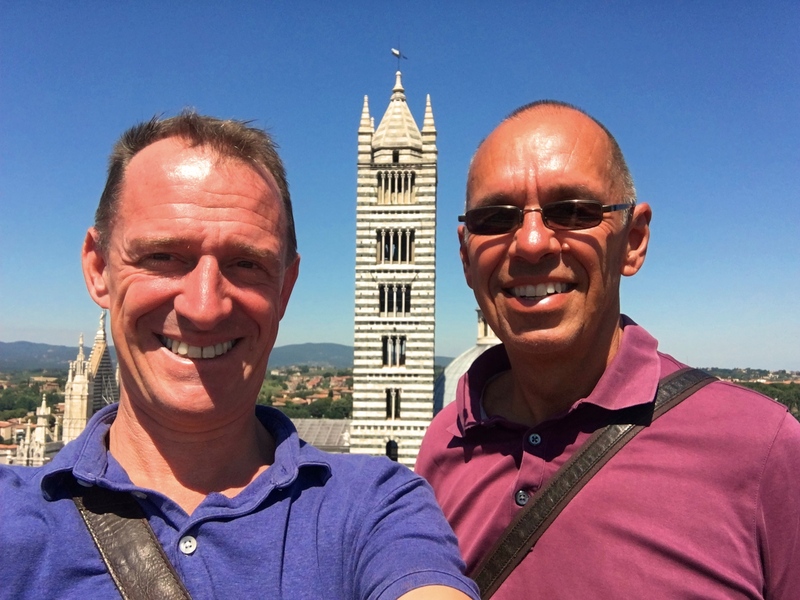 With both the Duomo and the bell tower, there was a lot of climbing to be done. Here are Dan and Elizabeth far above the city. 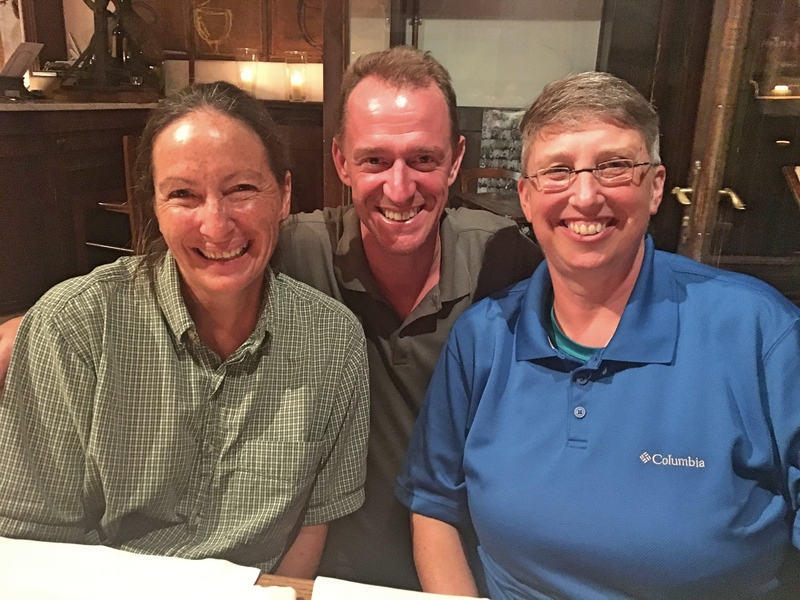 And finally, shortly before getting to Florence we discovered that our old friend Karen – from way back in our DC days – was going to be in Florence on her honeymoon the same time we would be there. So we took MA & Karen to dinner to celebrate. Thanks Facebook! 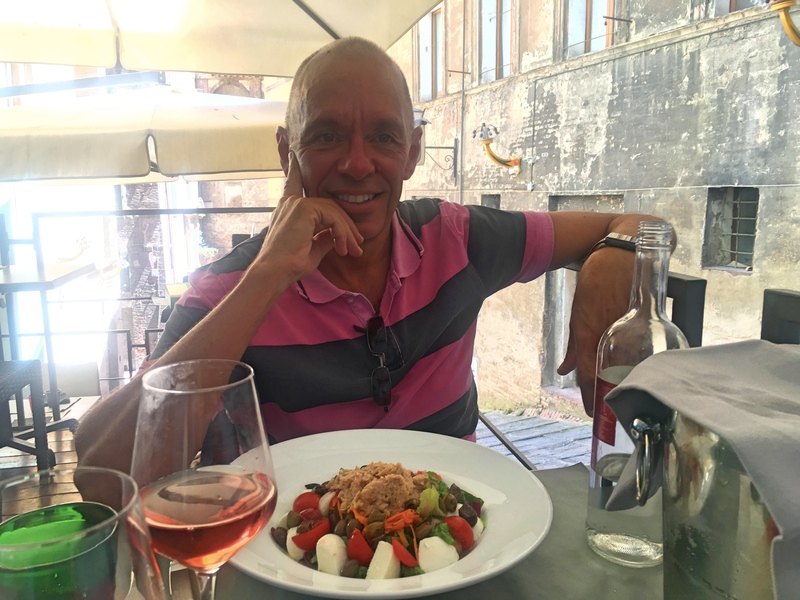 We’d been to Siena once before, but it was over 20 years ago and only for a day or at most two. So with a couple days before meeting Dan & Laura in Florence it made a perfect stop. 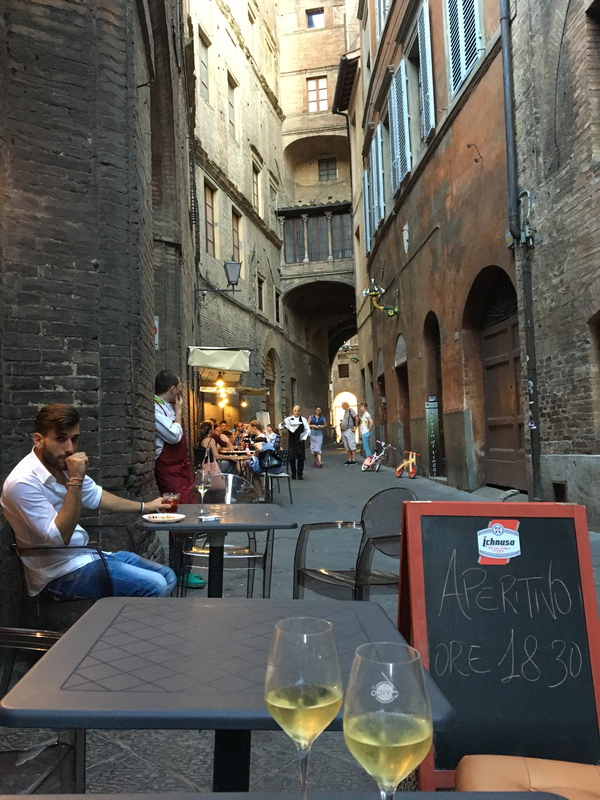 Siena is such a beautiful city in part because it failed. 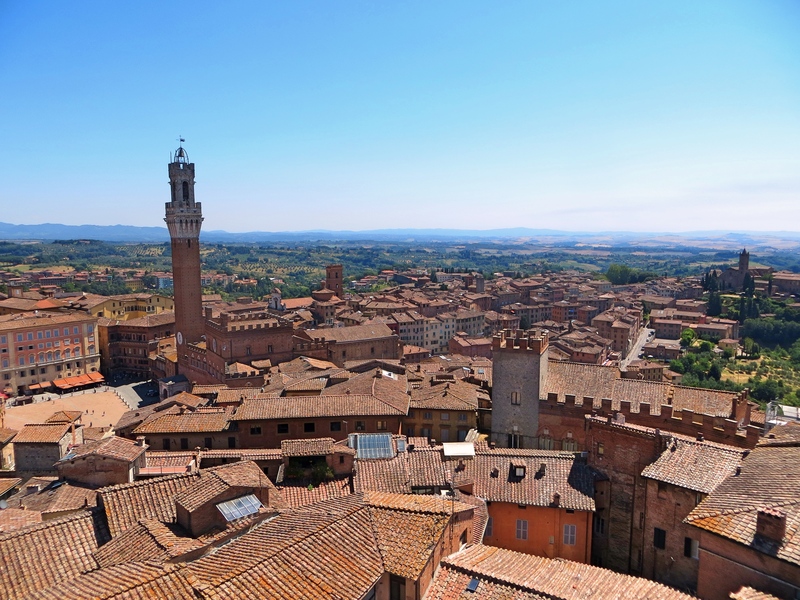 Back in medieval times Siena – allied primarily with the Holy Roman Emperor – competed with Florence, a supporter of the Pope in his battles with the Holy Roman Empire. By the late 13th century Florence had won and essentially subjugated Siena. 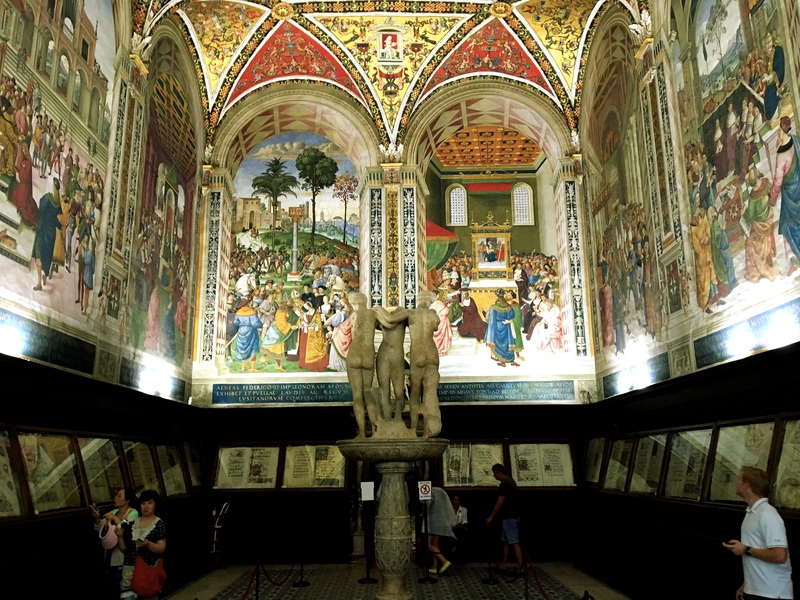 So while Florence flourished and moved into the Renaissance, Siena remained stuck in its Gothic time warp. 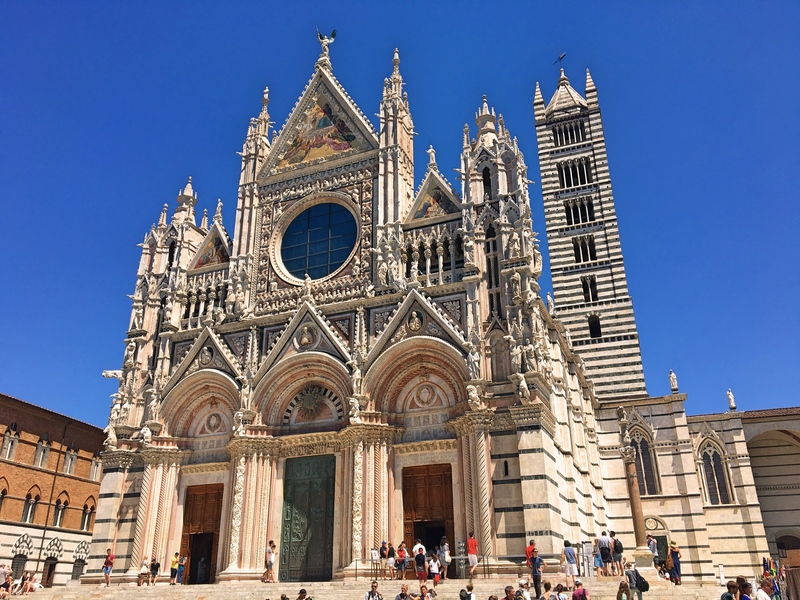 By the time the plague hit in the mid-14th century, killing half of Siena’s residents, they no longer had the strength to resist the Florentine Medici encroachment. 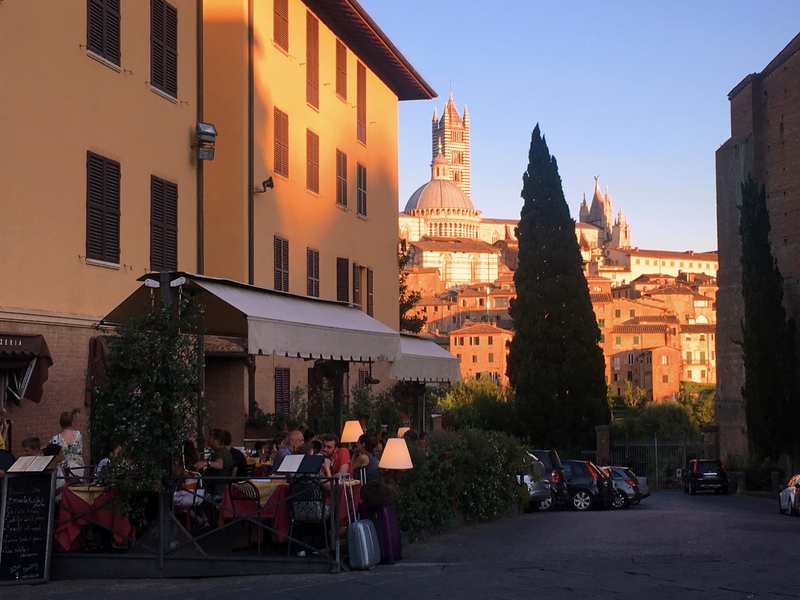 That history is abundantly alive as you walk through the city today, with UNESCO recognizing it as “the embodiment of a medieval city.” The highlight of all this is the Duomo, dating from the 13th century. The exterior is simply stunning, a gorgeous blend of white, green, and red marble. And then you go inside. Again, simply stunning, with black and white marble stripes giving the space real character. The marble inlaid floor, with over 50 panels designed by dozens of artists, is one of a kind. One of the side doors in the church leads to the Piccolomini Library, named for the guy who later became Pius II, has beautiful frescoes all around the walls and ceiling. These pictures can only begin to give a sense of it. 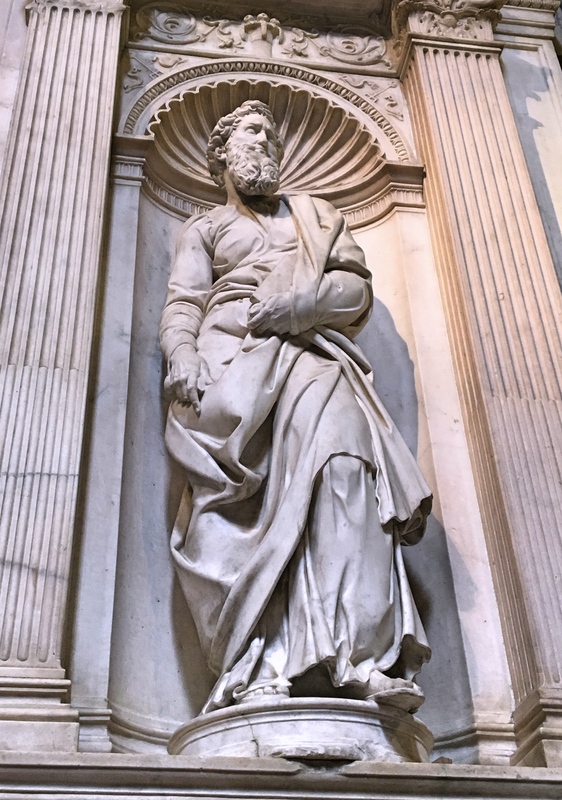 St. Paul, standing outside the Piccolomini Library, was sculpted by a young Michelangelo in the early 16th century, one of four of his statues in the Duomo. It is said that the face is a self portrait. 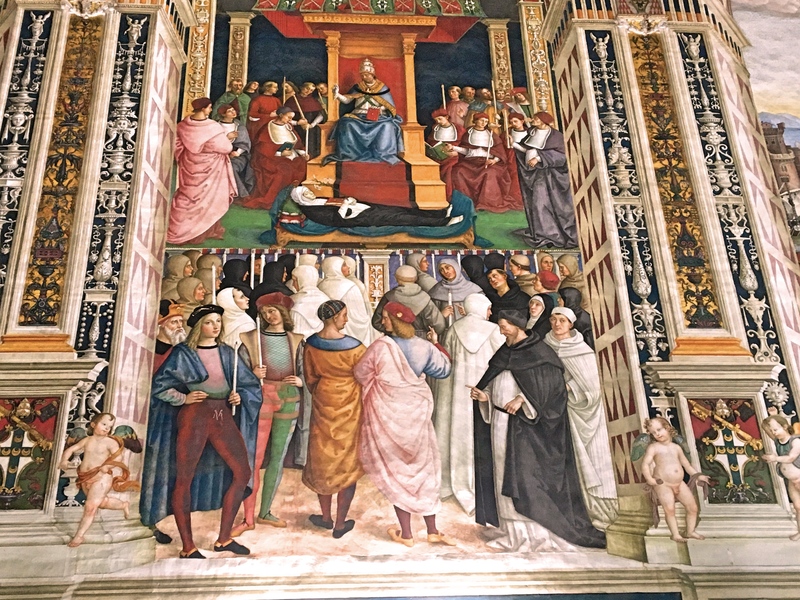 The canonization of St. Catherine of Siena, one of the frescoes in the Piccolomini Library (presumably before she was beheaded). The character in red tights in the lower left was Raphael, who was a young assistant to the primary painter Pintorichio, standing to his left. There were a few other sites associated with the Duomo that were treats as well. 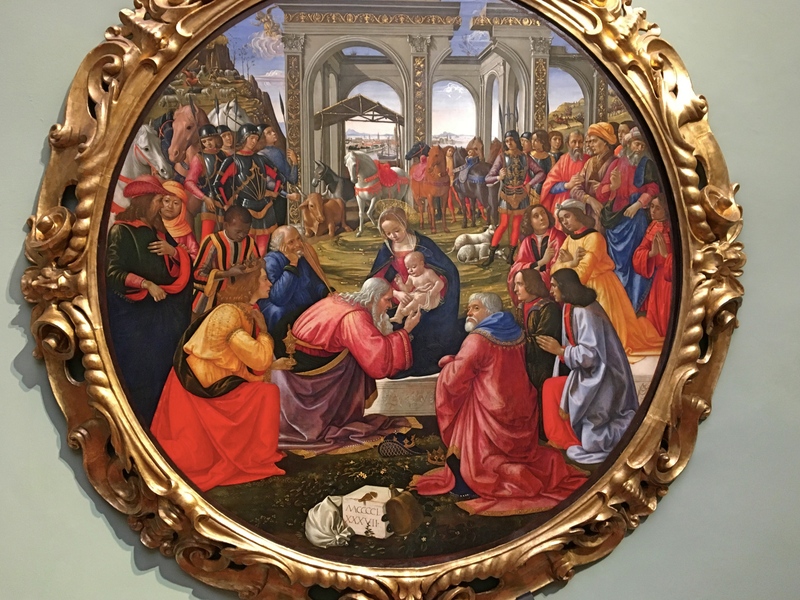 A nearby museum houses a lot of the original artwork from the church, while the nearby baptistry has works by Ghiberti and Donatello, two of the most important early Renaissance sculptors whose works inspired Michelangelo. 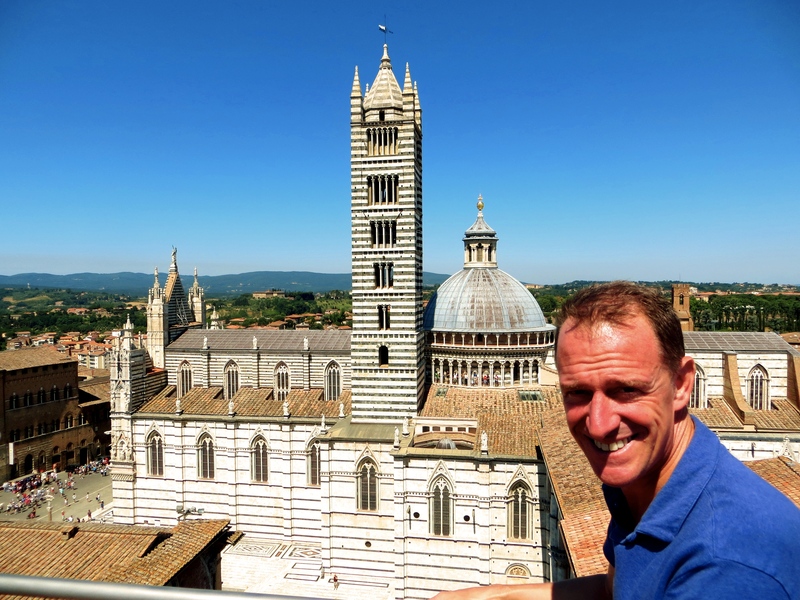 At some point in the 14th century there was a plan to expand the Duomo massively. They got some of it built, but then the plague hit and the economy went to hell and it was discovered that there were some serious problems with the architecture and they abandoned it. The good news though is that one of the major walls is still standing and you can climb up for some great views. 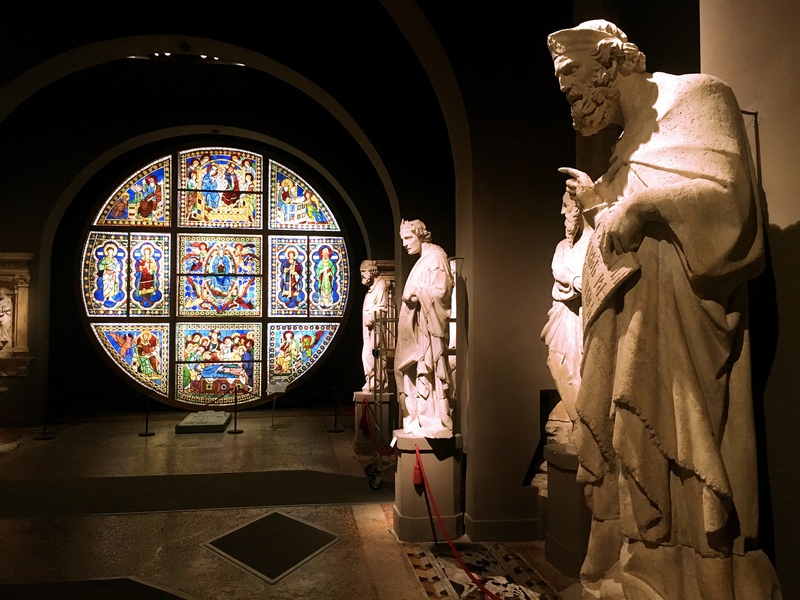 Some of the original statues from the Duomo, now housed in a nearby museum. They were made to be viewed from far below, explaining the strange way they lean out when viewed straight on. Mark atop the wall that was supposed to form part of the New Duomo. The expansion was never completed but the remaining wall makes a great viewing point. What else? The Piazza del Campo is the main square and the location of a twice-yearly horse race that’s been going on since the 16th century. The iconic tower of the Public Palace is another long climb with great views. View of the Campo from atop the Tower. During the daytime heat, people were always lined up inside the Tower’s shade. And then there’s St. Catherine of Siena. 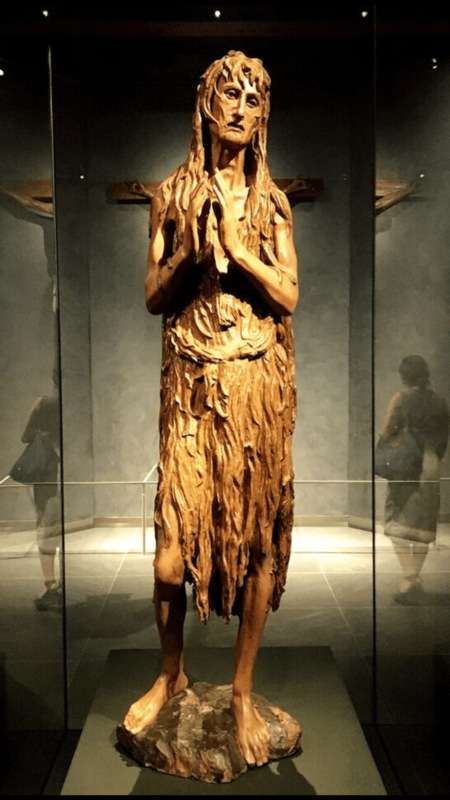 A saintly native of Siena (and probably a little weird), she died in Rome in 1380. Siena wanted her body back, but they knew they couldn’t get the whole body past the Roman guards who protected important relics. 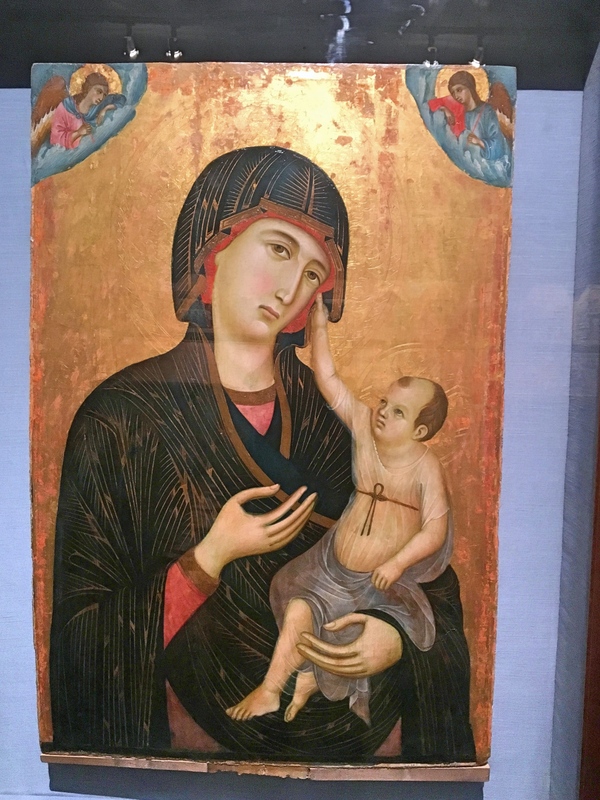 So a few of them went down to Rome, cut off her head, and brought that back, where it’s now proudly on display in a big church. They don’t let you too close, but it’s clearly a head. St. Catherine’s head. Photos weren’t allowed, so this is cadged from the web. 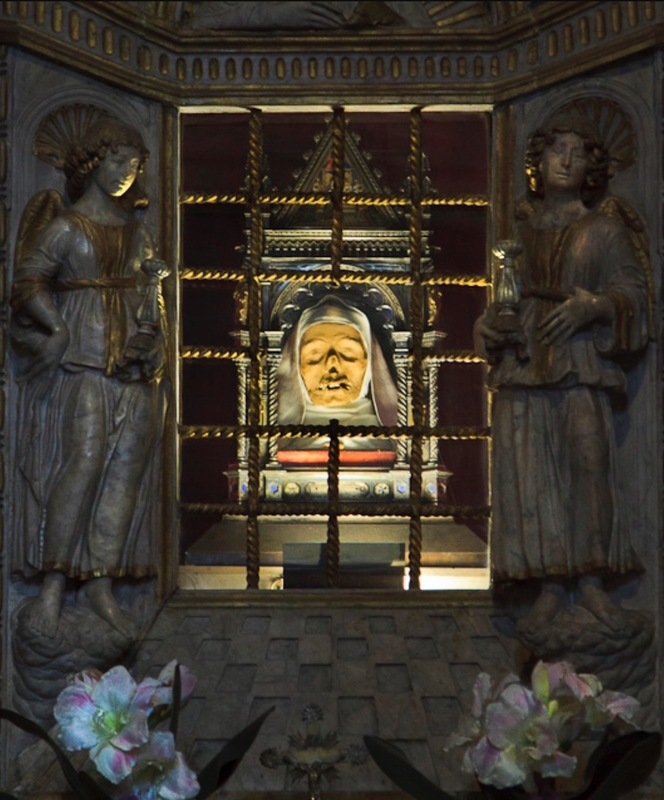 The relic of the sacred head of Saint Catherine of Siena has been conserved in this basilica since 1383. Numerous official and historical documents have established its veracity. The relic is the real head of Saint Catherine of Siena. OK, does that settle it? Finally, two changes we’ve noticed since our last visit. 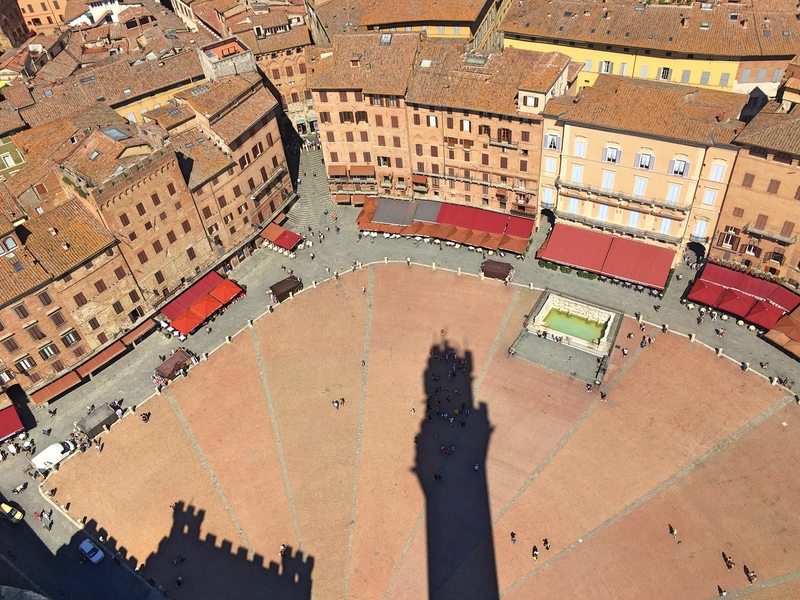 The small but sad change is at the top of the tower in the Piazza del Campo. When we were there in 1995 there were no “artificial” barriers around the perimeter. You could sit on the stones and – if you made a mistake – fall to your death. 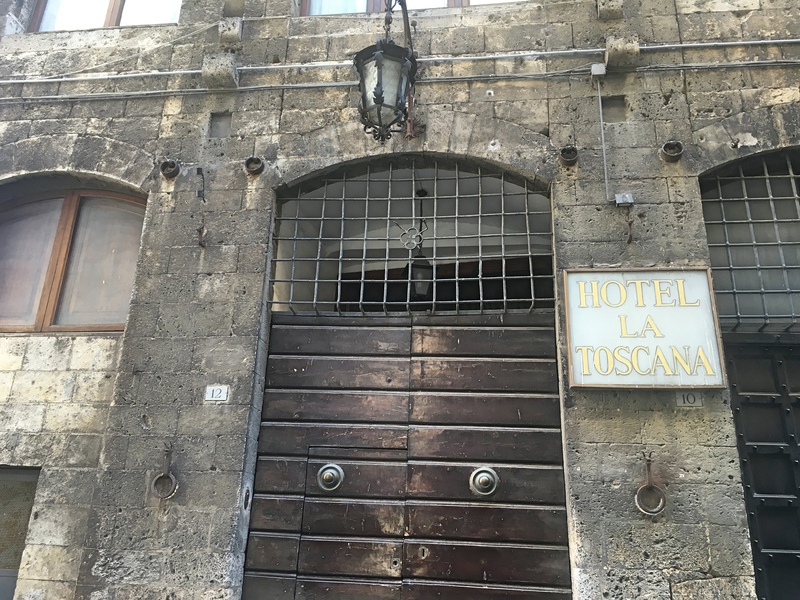 We were amazed that there had been no lawsuits requiring them to close it off and we’ve remarked on that difference between Italy and the U.S. many, many times since. Today? Yeah, railings around the top. You used to be able to just sit on that wall, though it could be fatal. Alas, now it’s safe. And the other big change? The number of tourists. 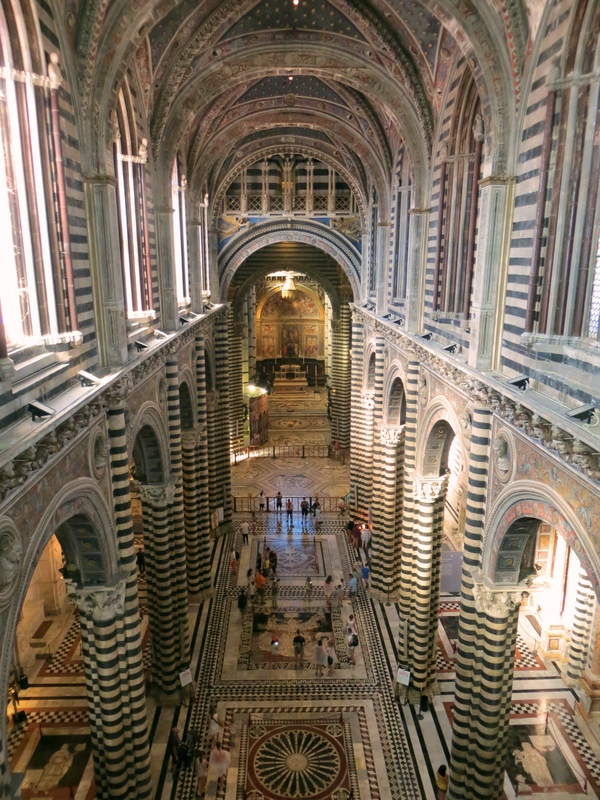 My God, but Siena is just swarming with hordes of tourists. Now admittedly we’re there in peak season but still. Wow. The world is getting richer and millions more people have the means to travel. On balance that’s a good thing. 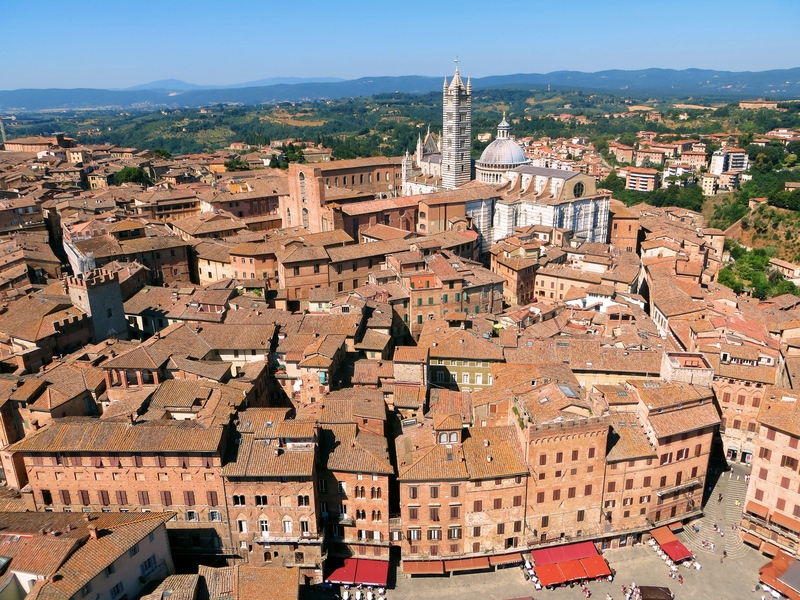 But it turns a place like Siena into something more akin to Disney World than a medieval city. From here we’re off to Florence to meet Dan & Laura. I’m sure we won’t have so many tourists there. Right? 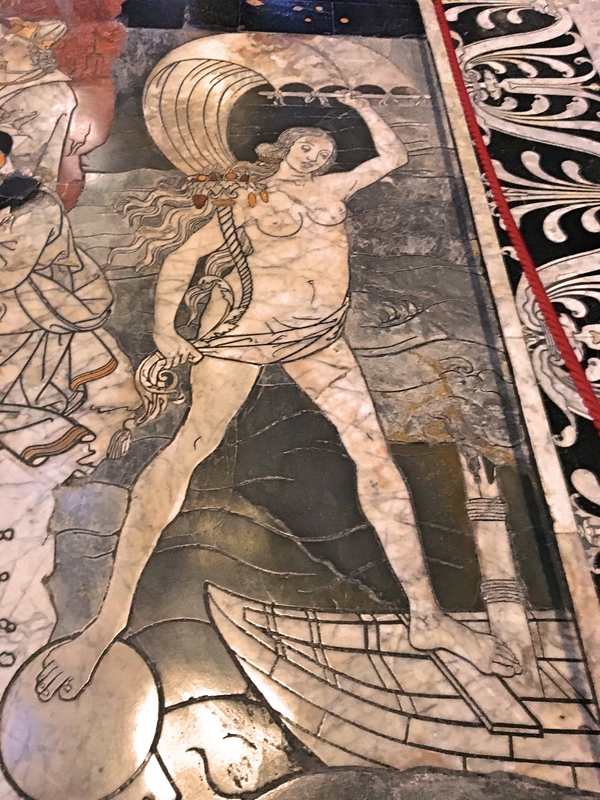 One of the marble inlays on the floor of the Duomo. This is Fortune, showing how unstable good luck can be with one foot on a sphere and the other on a boat with a broken mast. 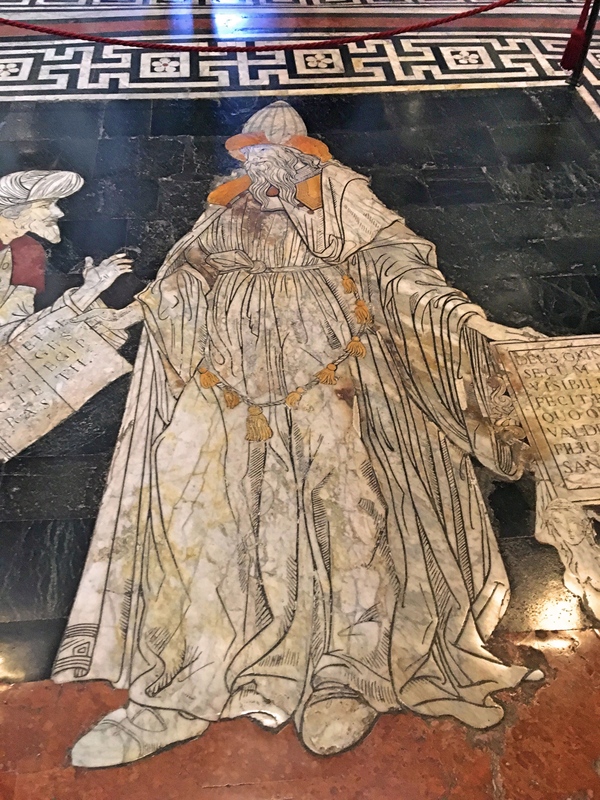 Hermes Trismegistus in marble on the floor of the Duomo. Believed to be derived from the Greek god of religion and mythology, Hermes, Hermes Trismegistus was thought to be a divine source of wisdom. Given his pagan roots, I was surprised to find him here in the Duomo, but his writings were big during the Renaissance. 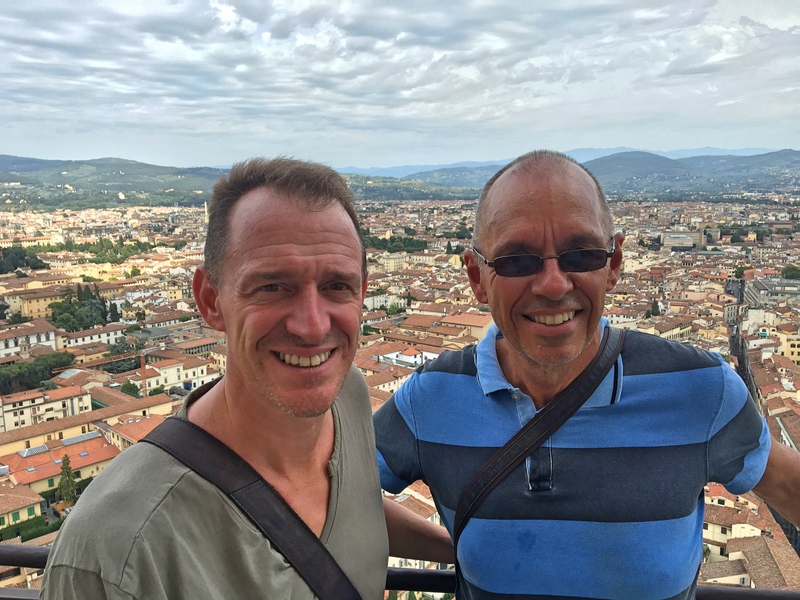 Me & Mark atop the wall of the never-finished New Duomo. The new church would have been enormous, reaching al the way back to that bell tower. This boarded up hotel was right across the street from our favorite lunch stop. We’re thinking with a little renovation this could be our next project. Sunset and the view of the Val d’Orcia from our bedroom. In the morning I’d go running up that dirt road in the foreground. Could it get any better? As we’re just bumming around here in northern Italy, we found a place just outside of Montepulciano available for three nights. 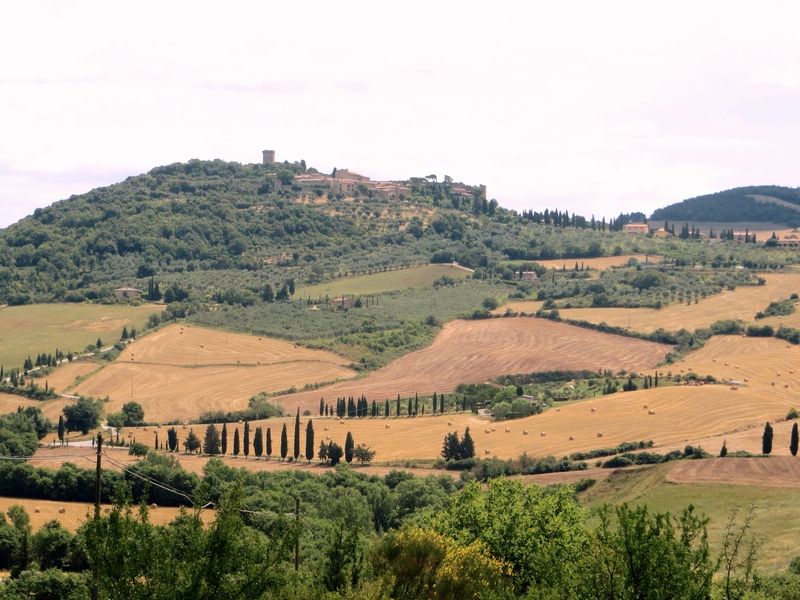 What do we know about Montepulciano? A Tuscan hill town 80 miles south of Florence, known in particular for its wine. We loved it. Or, to be more precise, I loved it. Really loved it. A true fantasy. Mark liked it. 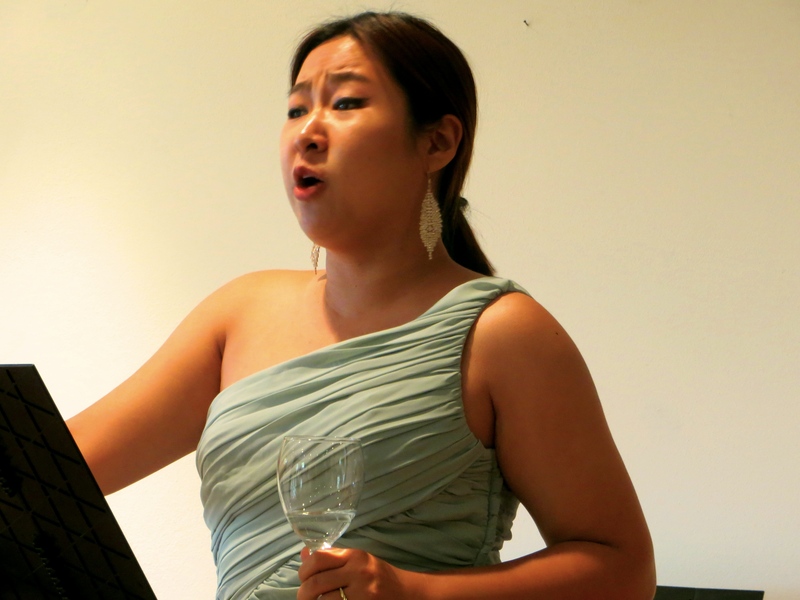 Jiwon Cornelia Choi, an opera student, performing at our little hotel. It was quite the treat. This was an unusual stop in one big way. Instead of staying in the town, or the center of the city, as we typically do, we stayed a couple miles outside of town. 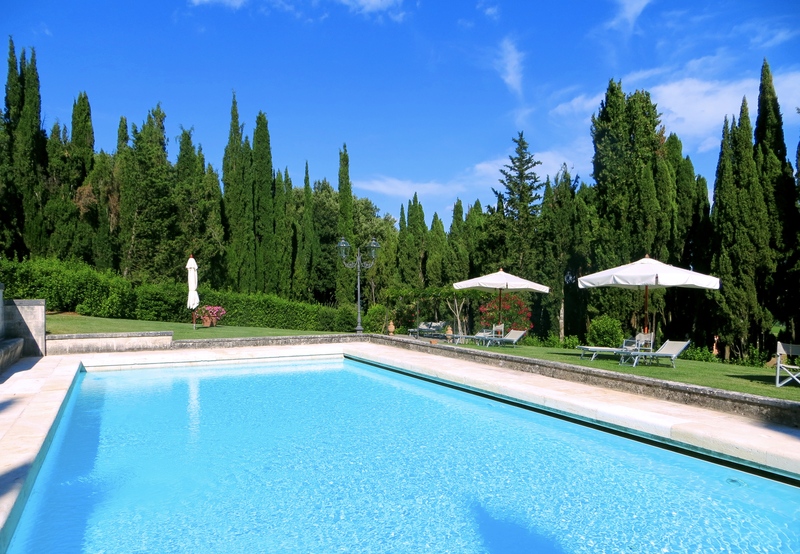 Villa Poggiano is a small boutique hotel on fabulous grounds out on a small dirt road. 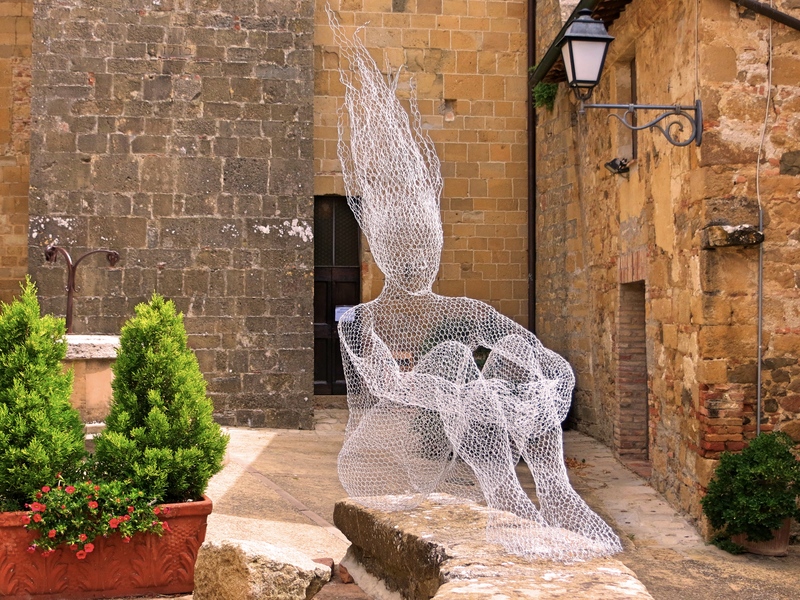 The town of Montepulciano is just a couple of miles away, but it’s as though you were in a different – quiet – world. That distance is a big part of why I loved it and why Mark only liked it. You see, to get into town for lunch or dinner, you had to get in your car and drive. And since the car was in his name, he had to do all the driving. The hotel and grounds themselves were a huge highlight. 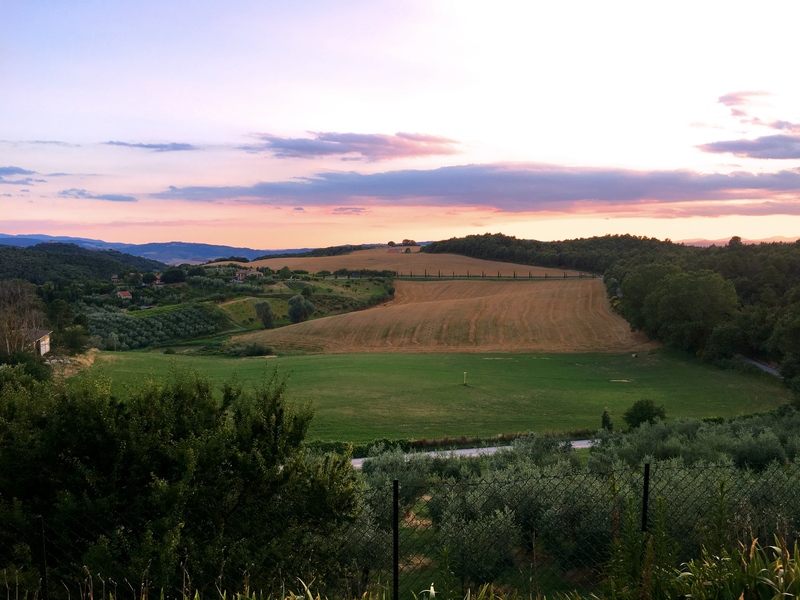 We had a drop-dead gorgeous view of Tuscany from our bedroom, and outside there were grand trees, a beautiful pool, and quiet places to read or drink grappa. 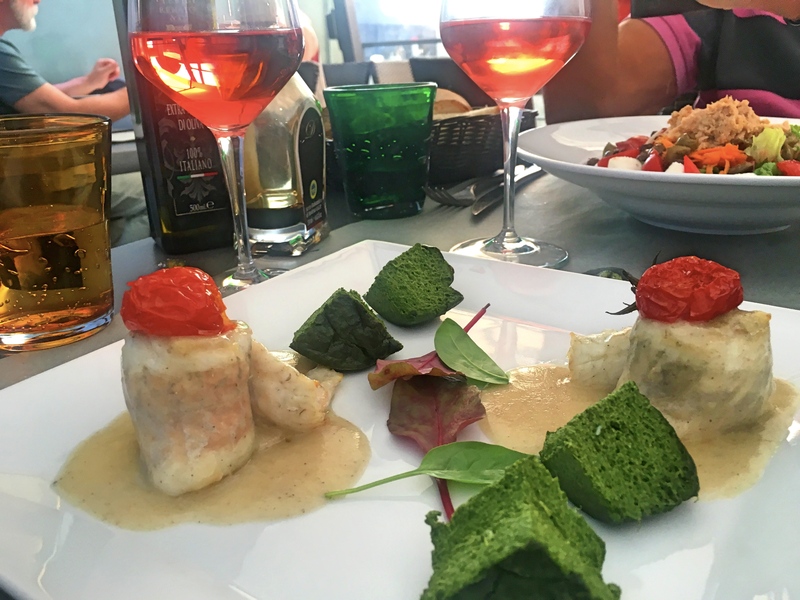 Villa Poggiano was pretty darned good, one of my favorite places in a long time. A couple times a year our hotel hosts a classical concert, and we just happened to be there on one of those nights. 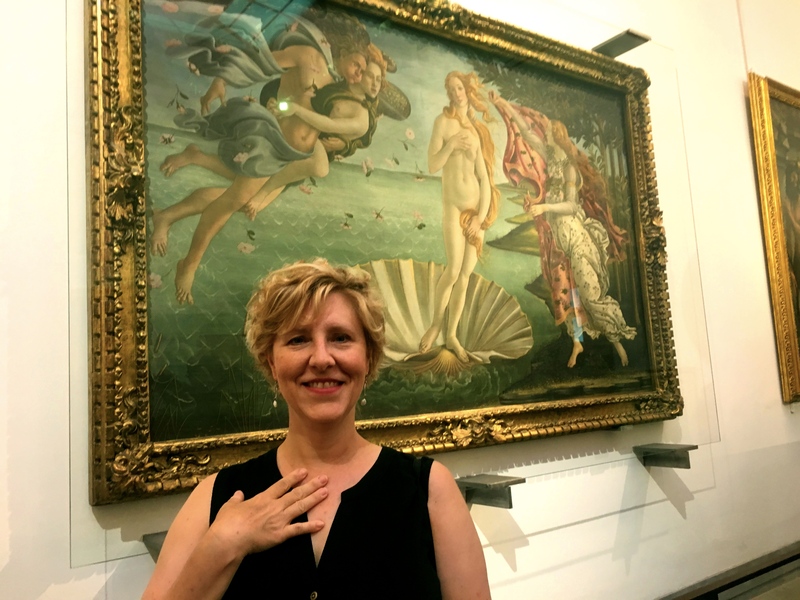 There were five young-ish opera singers, all women, doing a Master Class with some famous singer in Montepulciano, so they came and did a short concert for us. The singers were all pretty great, though of course there were a couple I liked better than the others. But a free concert (outsider had to pay like €2.00, but if you were staying there it was free)? Can’t beat it. 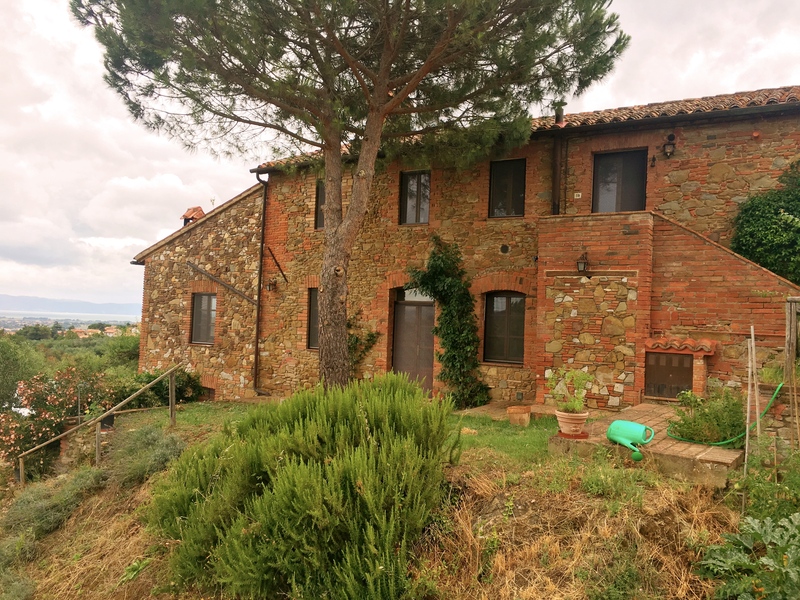 Old graduate school classmates of ours have a house maybe an hour southwest from Montepulciano in Paciano, a tiny old Umbrian hill town. It’s a place they plan to spend half their retirement, so we went for a visit. Sarah was away, but Erik showed us their old farmhouse, olive orchard, Paciano, and the neighboring Panicale. Both cute little towns and fun to see life as it’s lived by the (ex-pat) locals. And then the big, big excursion was an eight-mile hike out the dirt road behind our hotel. 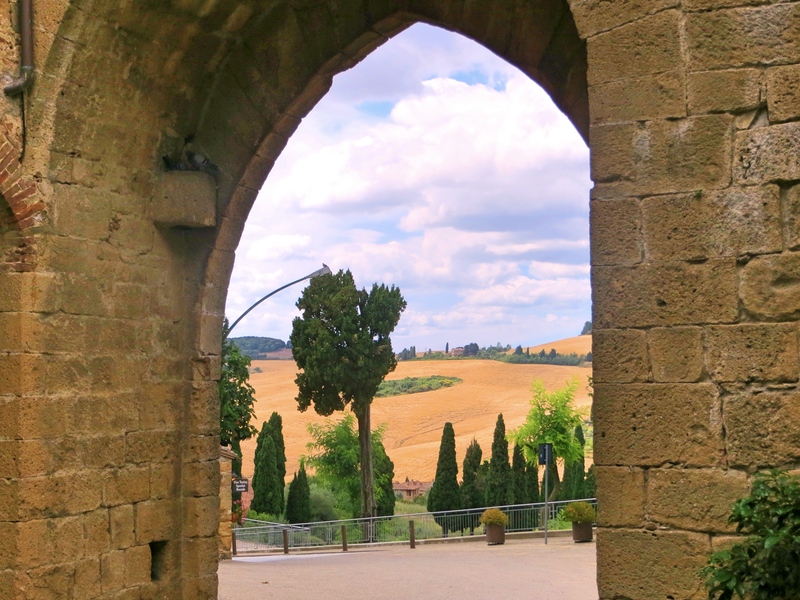 First we went to Monticchiello, a beautiful little town with classic Tuscan walls, gates, and architecture. 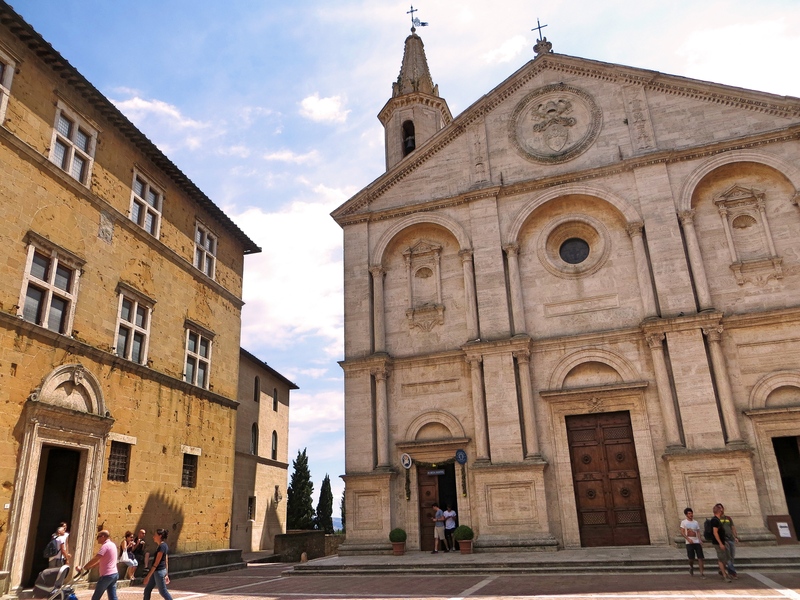 Then we continued overland to Pienza, yet another UNESCO World Heritage Site, in this case as the first place where Renaissance town-planning concepts were established when Pope Pius II decided to transform the look of his home town. And then back. All this, walking on little dirt roads with world-class views. It doesn’t get much better. Oh yeah, and the wine. 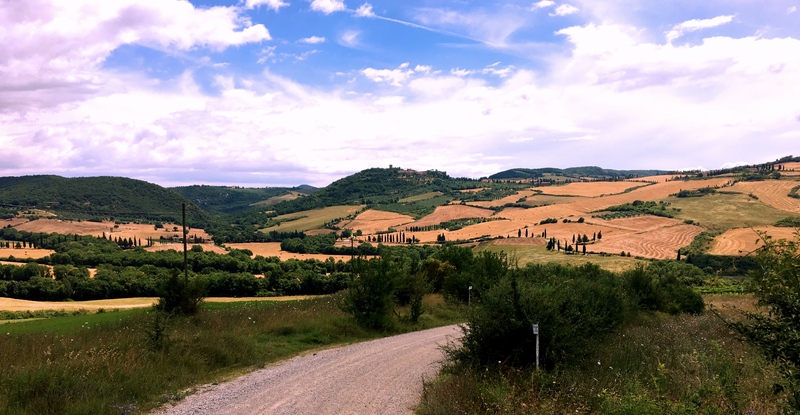 Montepulciano wines are supposed to be among the best in Italy, and that was certainly our impression. 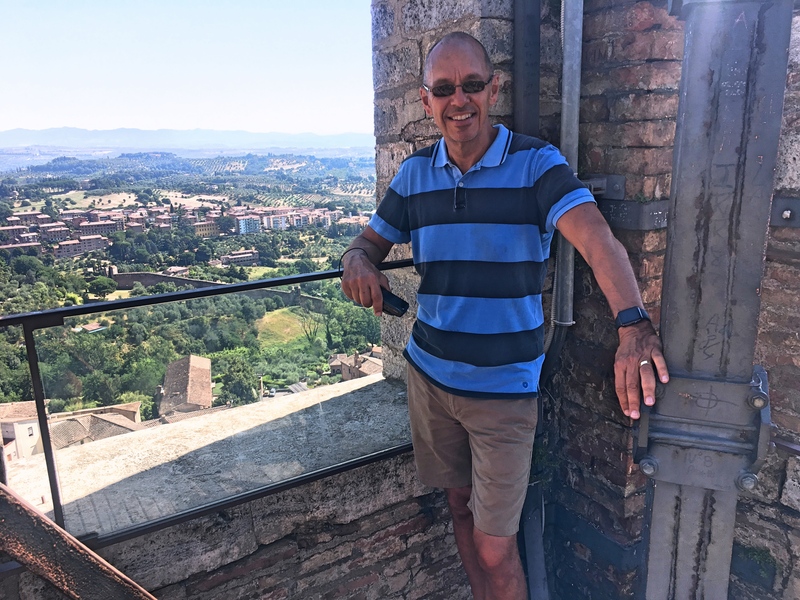 We didn’t spend much time in the town of Montepulciano itself. We’d go in for lunch or dinner but then really just head back. One of the amusing things to observe is that the town appears to be one of those places that is really on the American travel circuit. We often observe that unless you’re in Paris or Barcelona or Prague you just don’t hear many Americans. 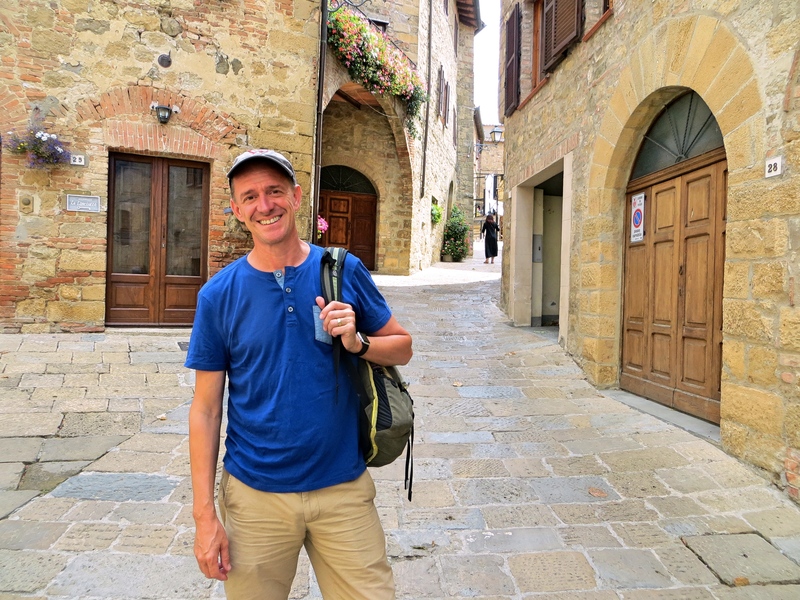 Apparently Montepulciano has been discovered, though, because there were Americans everywhere. OK, so I got my three days of rural heaven. From here we head into Siena and then on to Florence. We expect there’ll be no shortage of tourists there. 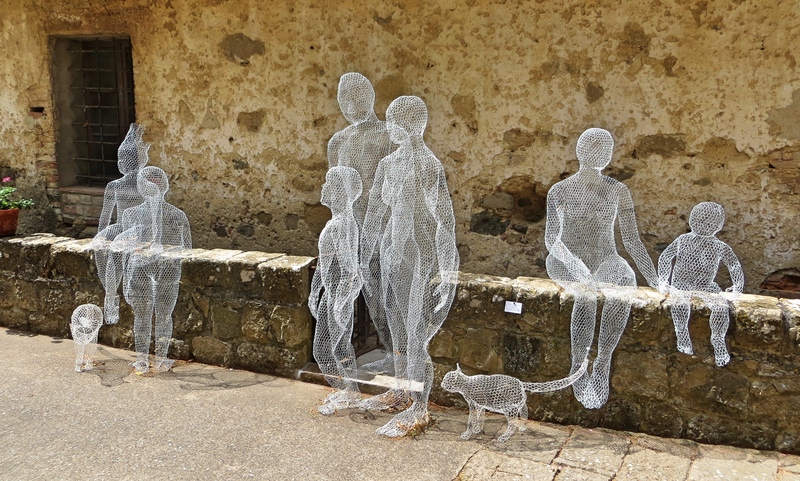 Monticchiello was really small, yet still it had an outdoor art exhibit of this family made of wire. It was surprisingly cool. 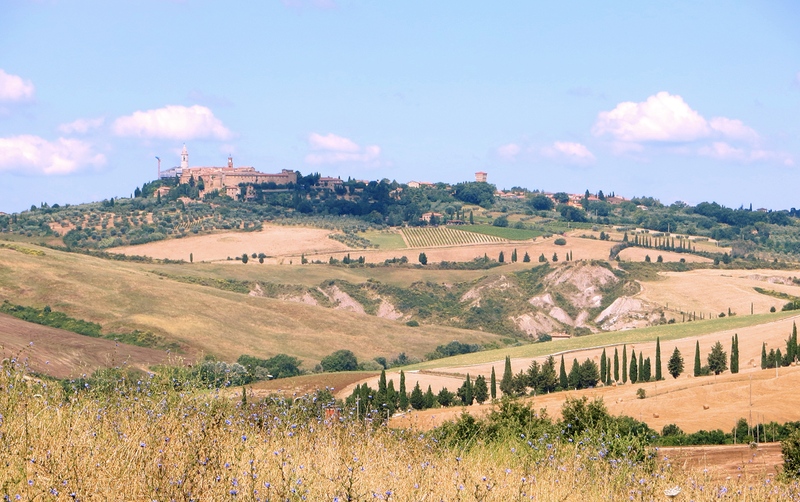 A view of Monticchiello on our way to Pienza. 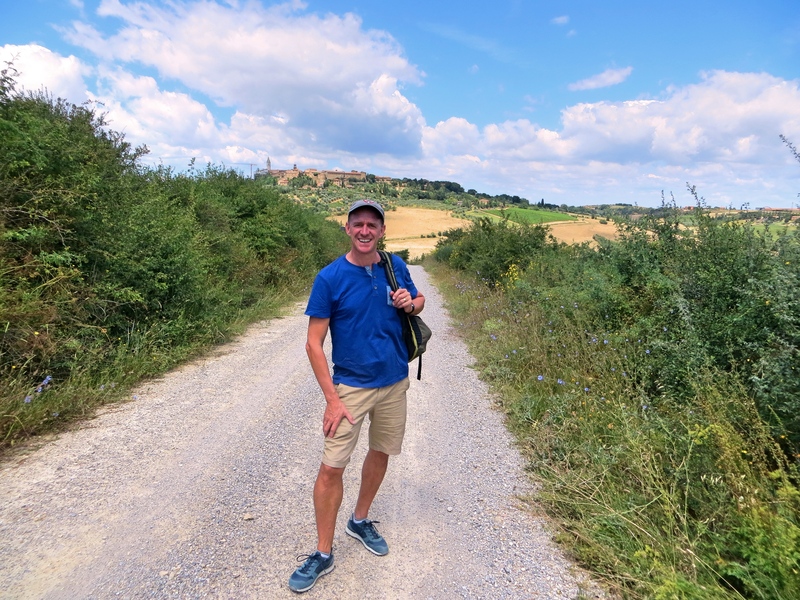 And yes, to get there we walked up that hill, then back down into the valley, before walking back up into Pienza. It was definitely worth it. 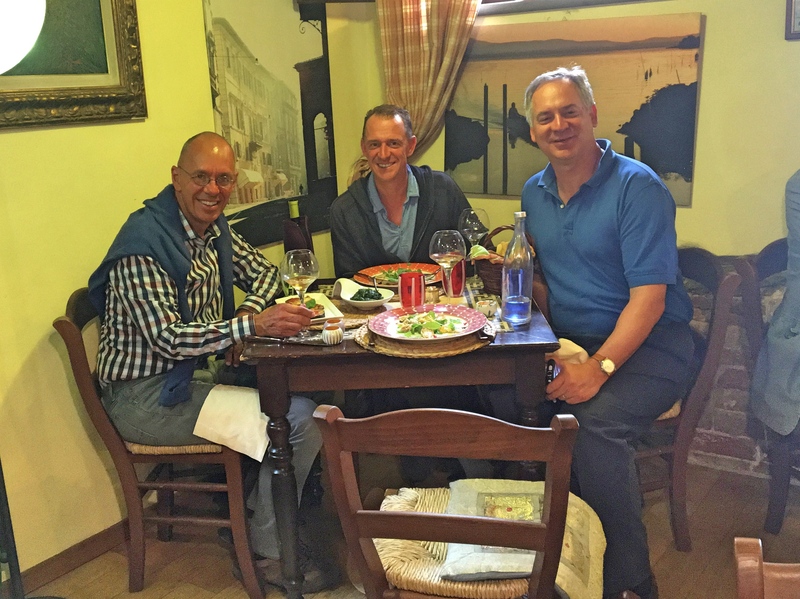 Lunch in Panicale with Erik was very much a small-town event. And every bit as you might expect in small town Italy. 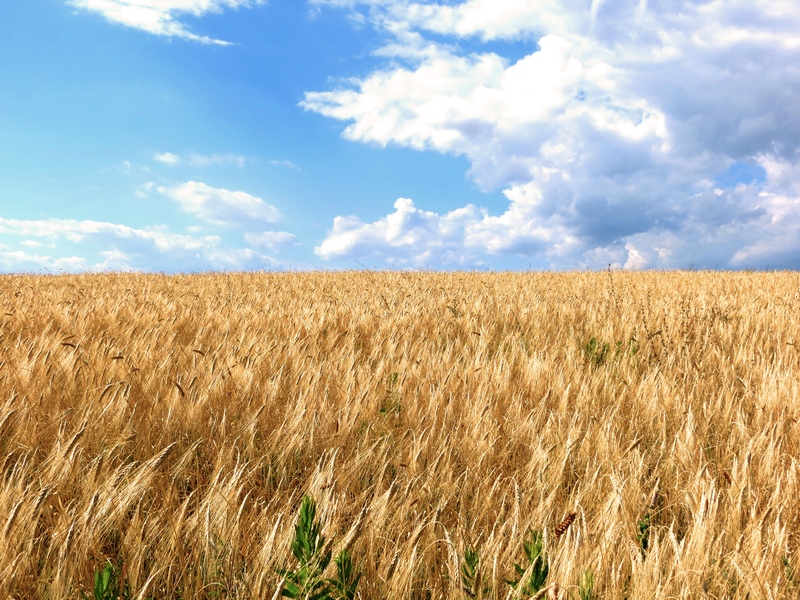 And finally, you think the U.S. is the only place with waves of amber grain? They grow a lot of food here.